In my last post I discussed my attempt at trying to be more organized with my blog posts by coming up with categories. When I can, I’d like to showcase a designer that I found while perusing the internet that I think is really good and that you will enjoy, if you aren’t aware of her/him already. Today I would like to introduce you to Jennifer at Chain8Designs. I belong to an email group called Bloglovin’, where you can sign up to receive posts from blogs you wish to follow – and they usually throw in a few more they think you might like. 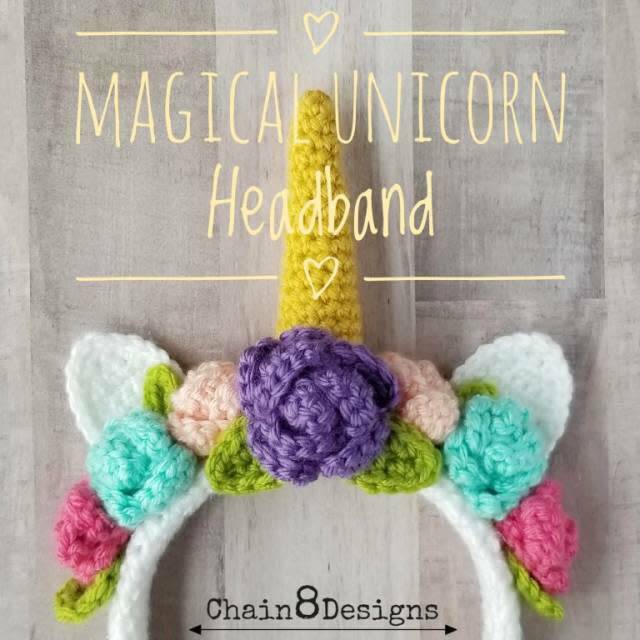 This Magical Unicorn headband design showed up in my feed, so of course I had to find out about the designer. She doesn’t have a large assortment of designs (but then, neither do I! ), but what she does have is wonderful. Jennifer also has Holiday Mouse and Festive Reindeer headbands, plus a fantastic Twitterpated Heart Beanie just in time for Valentines Day! And best of all – her patterns are free! So hurry and get over to see her work right now. You can also follow her on Instagram, facebook, and Pinterest. BTW, Jennifer’s pinterest boards are terrific, so make sure to check those out too. I hope you enjoy Jennifer’s work as much as I do, and, as always – Happy Crocheting!